The following is a contribution from EF Exchange student Olivia Lejonthun, who is visiting from Sweden to study at Avonworth. Whether you like it or not, if you’re in Sweden on the 13th of December, there is a 100% certainty that you’re going to find yourself in a dark room watching a group of people holding candles while wearing white clothing that appears to be your grandmother’s old nightgown. All these people in nightgowns are singing, often in different voices. If you go to a celebration at a church or a theater where the performers are professional singers, the different voices are, quite literally, music to your ears. However, if you go to a performance at a Daycare Center like many do, the different singing voices are likely to make you deaf – or at least wish you were. But you’ll enjoy it anyway, because at least the kids are cute. What I’m describing is the Swedish holiday Lucia. This holiday occurs on the most perfect day possible; on the 13th of December when the stress about all things holiday-related is catching up to you and you just need sit down, relax, and truly enjoy all that December has to offer; the darkness, the lights and the music. These three things is exactly what Lucia is all about. It is a celebration with Christian roots but has turned to a very secular celebration that all Swedes, no matter the religion, celebrate. According to the Christian legend, Saint Lucia was an Italian young woman who would bring food to the persecuted Christians in Rome. To be able to carry as much as possible, she’d wear candles in her hair. She was martyred, according to the legend, beheaded. It is from this legend that the Swedish holiday has developed. On the 13th of December every year, younger people sing and bring food to the older. The performers enters the room in a line singing Natten går tunga fjät, more commonly known as The Lucia Song, which is a song every Swede knows by heart, either in tune or out of tune. 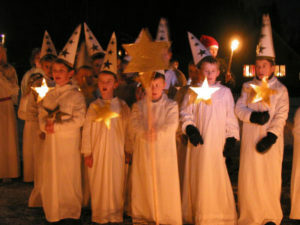 The line is led by the Lucia who wears a white nightgown, and a crown with lights on her head. These days many wear fake candles, especially in Daycare Centers, to prevent the many fires that would occur otherwise. The Lucia also wears a red ribbon around her waist. This ribbon is supposed to symbolize the blood from her beheading, the reason it’s worn around the waist rather than the neck is simply for aesthetic reasons. But as chokers are back in fashion, this tradition might change. Next in line after the Lucia comes a line of “tärnor,” who are traditionally female and essentially the Lucia’s sidekicks. Instead of candles in their hair they get to carry one candle in their hand and instead of a red ribbon they wear tinsel around their waists. This might sound fancier but for a Swede, it absolutely is not. Then comes the star boys, who wear ridiculous cones as hats and a stick with a star in their hands. They sing a lovely song about a farmhand who likes to ride horses which somehow is supposed to be related to Christmas. These three types of characters are the ones dressed in nightgowns. Next comes the Santa’s helpers, but the actual Santa in full costume and beard rarely shows up to the Lucia celebration. I suppose he’s too busy making Christmas gifts, or perhaps he’s just very bitter about the fact that even though he’s the biggest star of Christmas, he gets to be fourth in line.